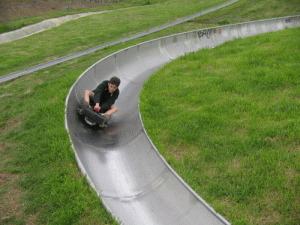 The Cool Runnings toboggan track is a summer track made of stainless steel. The entire track is 1,25km long, of which 821m is downhill. 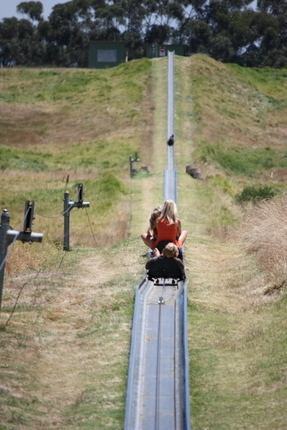 Each sled can take two riders and you do not have to pull it uphill as a draglift takes you to the top. A ride takes approximately 6 minutes and speeds of up to 40km/h can be reached. 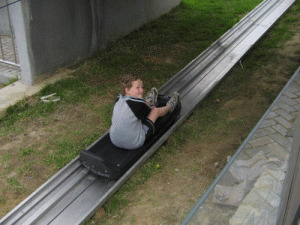 Strict safety precautions are addhered to and each individual sled can be braked. The highly trained staff and a qualified medic are on duty at all times. Many people think that only children will enjoy this. Till you get to the top. Bugz Family Playpark is the largest outdoor and indoor play park in the Western Cape and is geared to entertain two to ten year olds. The aim of Cape Town Science Centre is to provide children with interactive displays and activities showing that subjects like science, mathematics and technology can be fun! Helderberg Farm, is a hive of activities for young and old - quadbiking, walking, picnics, strawberry picking, combat games, etc. Cape Town have many centres offering horse riding lessons, outrides and various other activities. 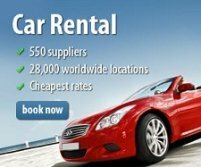 Expect a fast, well-built track, high-quality karts, electronic timing and results printouts complimented by a fully licensed pub for fast foods and refreshments. Ratanga Junction is situated a mere 10 minute drive from Cape Town. Attractions include 23 rides ranging from Kids Rides to Super Thrill Rides. At City Rock Indoor Rock Climbing Centre, kids can find their feet in a programme called "test drive" where children of 6 years and older climb under the supervision of an adult for as long as they want to. 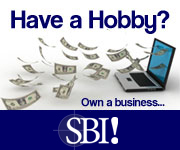 Return from Cool Runnings Toboggan page to Homepage.